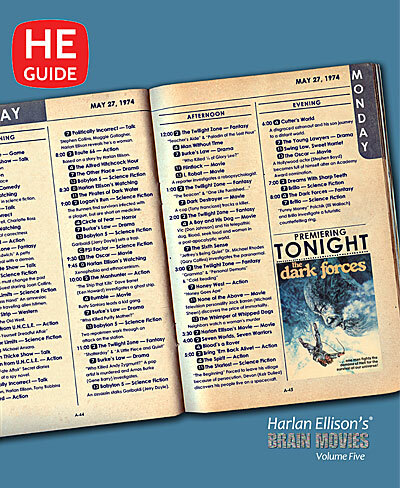 JOIN HARLAN ELLISON IN A BATTLE AGAINST THE DARK FORCES: “[The story] steals righteously from Lost Horizon and the marvelous works of H.P. Lovecraft and the caveats of Charles Fort and even the Dr. Strange comics (with a nod to Billy Batson, Captain Marvel, and the old wizard Shazam),” exclaimed Ellison in his 1972 NBC-TV pitch for The Dark Forces, an unproduced fantasy series. Disenchanted attorney Lee Kraiter travels to the roof of the world to learn the meaning of life. Instead, he returns to the Western World to wage a mystical war against the eponymous entities. Two versions of the pilot teleplay—“The Salamander Enchantment”—are included herein. SEE ELLISON’S FIRST ADVENTURE WITH THE CAPED CRUSADER: Though Harlan’s written numerous comic book scripts for the Dark Knight, his first slide down the Bat-Pole was in 1966 when he pitched an episode to ABC’s Batman, starring Adam West and Burt Ward. Tragically—for reasons explained in the editor’s notes—“The Two-Way Crimes of Two-Face” treatment was never produced, but now you can read what the Unrepentant Harlequin had in mind for the Dynamic Duo and their Bifurcated Foe. GO ON THE RUN, BECAUSE LIFE ENDS AT 30: Harlan Ellison was otherwise committed when his segment of MGM’s 1977–8 Logan’s Run television series (based on the 1976 film, itself based upon the 1967 novel by William F. Nolan and George Clayton Johnson) progressed from treatment to teleplay via Roberto Rossellini-collaborator Alfred Hayes (Paisan), but here—for the first time in print—is Ellison’s storyline for “Crypt,” which starred Gregory Harrison as Logan 5. TAKE ON ADOLF HITLER: Ellison’s unproduced teleplay for World War II action series The Rat Patrol—“The Duel to the Death Raid”—developed from a perfect pitch: What if the Allied soldier protagonists captured der Führer? Read what might have been if Ellison had joined the North African Campaign. HAVE YOUR FIFTEEN MINUTES OF FAME: The third of Ellison’s Burke’s Law teleplays—“Who Killed Andy Zygmunt?” finds the titular homicide chief investigating the murder of a an Andy Wharhol-esque pop artist.